With a little more than two minutes left in the NFC Championship game, the Green Bay Packers could smell the Super Bowl. Up 19-14 on the road against the defending champion Seattle Seahawks, the Packers could almost certainly run out the clock if they recovered the onside kick. Unfortunately, that proved to be easier said than done — just ask Packers tight end Brandon Bostick. There is no doubt that this gaffe is still haunting the second-year tight end and his teammates, even as preseason soldiers on. 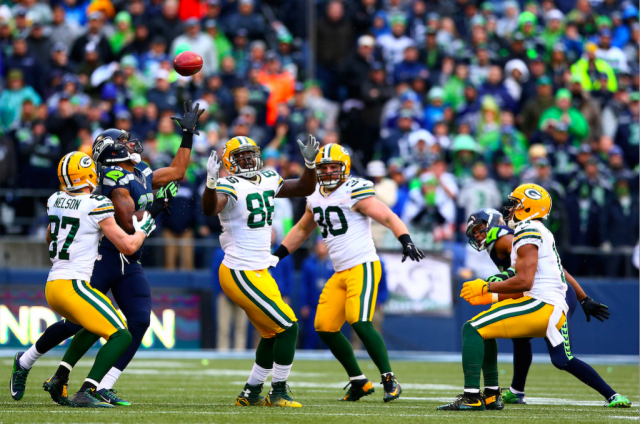 Don’t get us wrong: This is not the only reason the Packers won’t get the opportunity to play the New England Patriots with the Lombardi Trophy on the line — Green Bay’s defense couldn’t make a stop with the game on the line, and this inability to close out the Seahawks is what ultimately led to the team’s downfall — but this play still stings. And to make matters worse, Bostick admitted after the game that he wasn’t even supposed to catch the ball. His assignment was to actually block for receiver Jordy Nelson. Ouch. Note: We’ve got to give a nod to Russell Wilson’s Super Bowl interception, but that was less of a gaffe (unless you’re talking about their offensive coordinator) and more of a tremendous play by the Patriots defense. As such, we’ve declined to list it here. Tony Romo was great for the Dallas Cowboys last season. He was one of the main reasons they won the NFC East and advanced in the playoffs. However, he is oftentimes remembered for coming up short during big moments. One of his more famous blunders occurred during the 2006 playoffs against the Seattle Seahawks. Romo botched the hold on what would have been the game-winning field goal. We’re not sure if he’s ever lived this one down. It has to still sting. In the 2012 AFC Championship game, Baltimore Ravens kicker Billy Cundiff missed a 32-yard field goal attempt that would’ve sent the game to overtime. This is supposed to be a chip shot for a seasoned kicker, but sometimes the moment proves to be too much. Cundiff was later told that this was the first fourth-quarter kick that he’d missed all season. We’re sure that made him feel so much better. There are gaffes that hurt your team in the playoffs, and then there are gaffes that cost your team a title. Scott Norwood’s 47-yard miss in Super Bowl XXV is the most famous of them all. The Buffalo Bills were a great team and this was their moment to take it all. But Norwood misjudged the wind, and his kick sailed wide right. To this day, this is a moment that continues to torture the Buffalo faithful. Even if they win a championship someday, the moment will probably haunt them until the end of time.